Letters From Santa Makes Kids Flip! Kids flip when they see Letters from Santa‘s bright red package come in the mail with their name on it! Addressed with a shiny gold foil shipping label, a real North Pole postage stamp and an authentic return address label from Santa’s workshop! Includes Personalized Santa Letter, Personalized Nice List Certificate, Custom Rudolph Letter, Collectors Swatch of Santa’s Suit, Genuine Reindeer Food in Collector’s Tin, Magic North Pole Snow, and more! 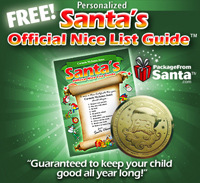 Get your child’s Free Santa’s Personalized Nice List Guide Now! 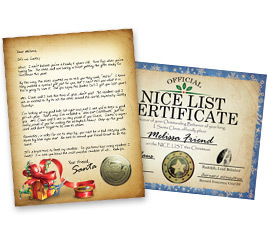 Personalized the Nice List Guide with special things your child should do to earn a spot on Santa’s Official Nice List!